THE B.A.C. IX. - This efficient sailplane has recently been designed and marketed by the B.A.C. Co., Ltd., of Maidstone, in such a form that all parts may be bought separately and assembled by club members, who thereby are enabled to obtain an efficient sailplane ДальшеMore>>> at a minimum cost. As will be seen from the drawing, this is a high-wing cantilever monoplane of exceptionally clean design, and, in order to facilitate manufacture and transport, the wing is constructed in halves which are joined together by three pins. The elevator and rudder are interchangeable, and, so as to avoid the extreme sensitivity usually associated with an elevator formed in one piece without a preceding fixed tailplane, the control is arranged differentially, thus allowing a comparatively large travel of the control column at the start, with a correspondingly small movement of the elevator. The ailerons, which run the whole length of each wing, are operated by push-and-pull tubes projecting through the sides of the fuselage. To cater for clubs whose financial resources may be slender, gradual payments can be obtained. At the present time the complete set of parts costs approximately ?35 10s. If desired, this machine may also be obtained with a quick-release adjustment and an auto-towing chassis. ON the afternoon of Sunday, November 27, at Hanworth, Mr. Lowe-Wylde demonstrated his “Baby'' aeroplanes before a gathering which, considering the state of the weather, was surprisingly large. Among the many interested spectators were the Master of Sempill, Lt. Col. J. T. C Moore-Brabazon, Lt. Col. F. C. Shelmerdine, Air Com. F. E. Guest, Mr. E. C. Gordon England and A.M. Sir Geoffrey Salmond, who, incidentally, had a short flight in an autogiro. Mr. Lowe-Wylde's "B.A.C. VII" glider is, of course, well known, and has been mentioned in FLIGHT many times in the past. 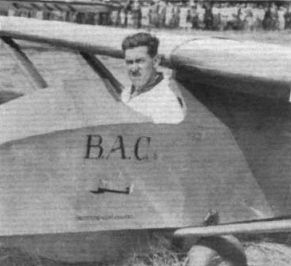 His "Baby" aeroplane is this same glider powered with a horizontally opposed flat twin "Douglas" motor-cycle engine of 600 c.c. (14 b.h.p.) 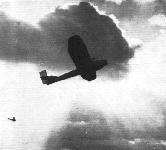 mounted on a metal-tube structure above the wing, giving the machine an air speed of about 40 m.p.h. On Sunday afternoon, in the capable hands of Mr. Lowe-Wylde and Capt. E. D. Ayre, two of these interesting machines gave unquestionable proof of their airworthiness, in spite of the rain and wind, which at times was blowing in quite strong gusts. It was noticeable that a "Moth," which was flying at the same time, seemed to be more affected by the bumps than did the "Babies." Mr. Lowe-Wylde was content to parade his machine round the aerodrome, but Capt. Ayre was more skittish, and, although he did not put his machine "through a series of hair-raising manoeuvres" as was reported in one daily paper, yet he certainly did treat the spectators to a very pretty display of crazy flying, which demonstrated quite clearly the manoeuvrability of this type of aircraft. From the ground it certainly looked as though the machine answered easily and quickly to the controls. The two pilots also flew in formation, but, again, Capt. Ayre was more interested in making sudden little dives at the ground, after the manner of a seagull fishing for its supper, than he was in seriously attempting to keep formation. While the "Babies" were showing off their paces, two autogiros were also flying round, no doubt a little jealous and, perhaps, even a little nervous for their reputation, but, nevertheless, providing an excellent comparison. Mr. Lowe-Wylde's machines left the ground in half the distance taken by the autogiros, and although they did not quite sit still on touching the ground like their weird wingless sisters, still they only ran a very few yards, but it must be admitted they showed a distinct tendency to float when only a few feet off the ground. The normal landing speed of the "Babies" must be about 15 m.p.h., but in spite of Sunday's gusty weather they seemed to land very easily (or was it due to the skill of the pilots? ), also out of half-a-dozen landings which each pilot made there was never a sign of a single little bounce; neither did the machines show the slightest tendency to be blown over, while on the ground, by the windy gusts. Mr. Lowe-Wylde claims that his machines possess a very small angle of glide, which he was unfortunately unable to demonstrate on Sunday owing to the wind necessitating the use of the engine while landing. Also he states that they do not stall easily, and that their behaviour after doing so is in no way alarming. This little aeroplane is, of course, only in an experimental stage, and will no doubt be vastly improved. The engine mounting, for instance, is crude and the petrol tank unnecessarily exposed. We understand that an entirely different design is the ultimate object of these experiments. So much for the machines themselves; now a word about their utility and possibilities. One gentleman, well known in aeronautical circles, was heard to remark that these "Baby" machines were only toys and could serve no useful purpose. That, of course, is far from being a fair criticism, and in any case one might remind this critic that the invention of steam-powered engines owes its origin to a boy toying with a kettle; whilst there is a popular story that the man who first made experiments with electricity had his curiosity aroused while flying a kite in a thunderstorm. 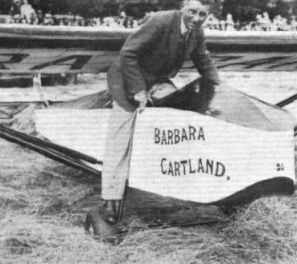 Actually these "Baby" aeroplanes bear the same comparison to what the same critic called "real aeroplanes," as the small yacht or speedboat does to a liner, or as the "Baby" car does to a larger motor vehicle, and no one would accuse either a speedboat or a Morris Minor of being devoid of utility. One very good use to which these little aeroplanes could be put is for instructional purposes. The first thing that a would-be pilot has to learn is to acquire an "air sense," which is not generally developed until several hours' solo have been done; and the dangerous period in a pupil's training is when he or she is acquiring this "air sense." This could be acquired as easily on Mr. Lowe-Wylde's machines as on light aeroplanes more highly powered and in a shorter time. The advantages of such a "Baby” machine so used are twofold; firstly cheapness, and secondly safety. Mr. Lowe-Wylde's "Babies" could probably be marketed at about ?150 if the demand was great enough, and the cost of upkeep and running would be ridiculously small - one and a-half hours' flying on one gallon of petrol! As regards safety, it is a known fact that a large proportion of flying accidents occur either when the machine is landing or when it is gliding in to land. Mr. Lowe-Wylde's "Babies" could be glided in at a very slow speed and manoeuvred in a most outrageous way without danger being caused to the pilot. As for piling them up landing - well, the difficulty would be to do it rather than to avoid doing it. In conclusion, though these machines are only "Babies," still even babies grow up, and if properly nurtured become useful members of the community. Also, Mr. Lowe-Wylde can be doing no harm to aviation by his experiment, and "those that are not against us are for us.” It rests very largely, as we have many times pointed out, with getting a suitable engine, and if the two Douglas aircraft engines, now being built, turn out successful, then this problem should largely be solved. The new intermediate training type glider, built by the British Aircraft Co. at Maidstone, being flown by its designer, Mr. Lowe-Wylde. The latest Lowe-Wylde training glider, which has been designed to replace the usual Zogling type. This glider has a form of fuselage which is ply-wood covered. The wings are strutted with spruce struts covered in ply, as is the leading edge of the wing. AUTO-GLIDING: Mr. Lowe Wylde making a towed flight in his Glider at Hanworth. A worm's eye view of Lowe Wylde on his glider. 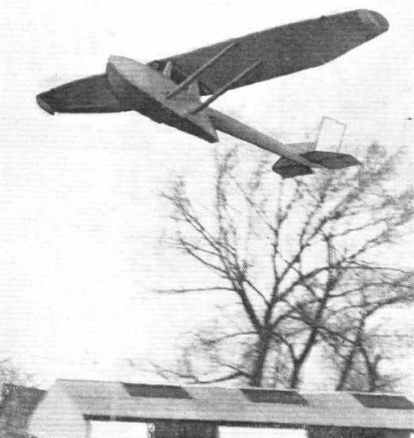 "THE END OF A PERFECT TOW": The Lowe Wylde "Auto-Glider" about to land after being towed by the car seen in the foreground. Mr. Lowe-Wylde on his B.A.C. getting ready to go up and find the clouds. Mr. Mole on the Barbara Cartland getting ready to go up and find the clouds. A view down the gallery at the Agricultural Hall. The gliders from left to right are the Hols-der-Teufel, the Scud, the Albatross, and the B.A.C. VI. Between this last and the Albatross is one of the Rice folding caravans. THREE "MISSING" ENGINES: The B.A.C. Gliders circling in line astern. 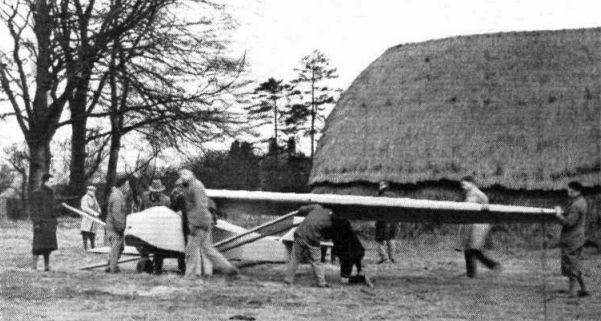 AT DUNSTABLE: Erecting the B.A.C.VII in a field near Dunstable preparatory to doing some auto-towed gliding during the Easter holidays. HYDROGLYDING: On December 7 Mr. Lowe Wylde carried out some tests in taking off from and alighting on water in a glider at the Welsh Harp, Hendon. Our top picture shows the glider being towed off the water by a motor boat, and below is a close-up of the glider. THE B.A.C. 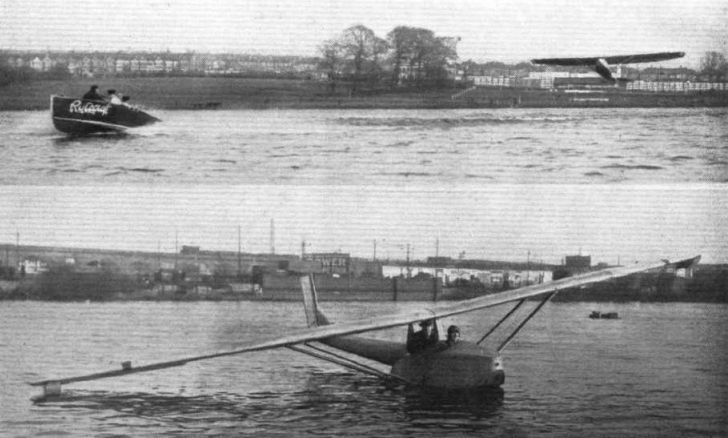 "HYDROGLYDER": View of the glider with which Mr. Lowe Wylde has been carrying out tests on the Welsh Harp, Hendon.